Tanita IronMan Ironman Segmental Composition Monitor | OhGizmo! Tanita, a company well known for their professional scales has recently joined forces with the IronMan brand to produce a line of scales that do far more than just measure your weight. 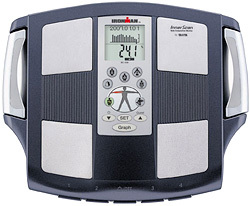 The flagship model, the BC558 is actually a ‘Segmental Body Composition Monitor’ which means it provides a body composition reading for each body segment. This includes the trunk and your individual arms and legs using both standard feet electrodes and retractable handgrip electrodes. The scale can provide specific data for each segment including the weight, body fat percentage, total body water percentage, full muscle mass, basic metabolic rate and age, bone mass, visceral fat and even an overall physique rating. All this data can even be stored and visually presented in a graph going as far back as 36 months to see how you’ve improved or pinpoint where things went wrong. While there’s no reason everyone can’t take advantage of the scale it’s particularly suited to athletes (hence the IronMan tie-in) who are monitoring the balance of the left and right side of their body or who are trying to improve or rehabilitate a specific limb. Tanita Ironman Segmental (and Full Body) Composition Monitor is available from the TheCompetitiveEdge.com for $269.99. This is a FANTASTIC scale that has allow me to focus and maximize my training to tune my training program!